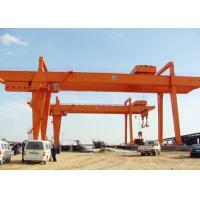 Material: Steels Q235, Q345, etc. 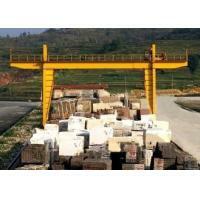 Rail mounted gantry crane is a kind of rail mounted crane used to offload, stack and load 20ft, 40ft, 45ft ISO standard containers. Its provision of power is offered by cable reel. 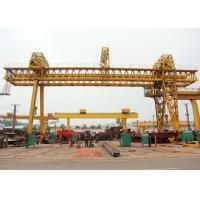 The crane contains three mechanisms: hoisting, trolley travelling and gantry travelling. 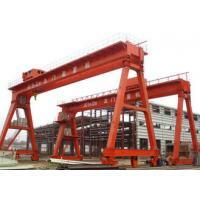 The trolley running along the track mounted on gantry beam is capable to serve among legs. The crane is able to make straight movement along rails. The crane is equipped with appropriate flexible hydraulic container spreader, which is connected to trolley through the upper frame and wire rope system. 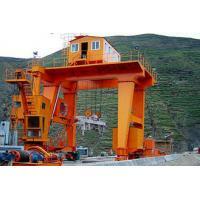 And the hydraulic power comes from spreader itself, and we just provide the power supply and communication. 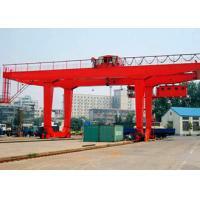 Hoisting mechanism and trolley travel are able to work simultaneously or separately with load; the same applies to gantry travel and trolley travel. Electrical drive of main working mechanism is equipped with full digital AC frequency convertor, PLC speed governor and constant power adjustment device for hoisting mechanism. 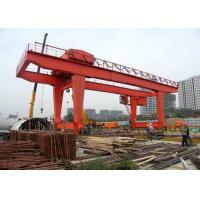 The crane has a monitoring and management system. It has the function of data collection, analysis, management, and fault diagnosis and is also able to deliver the main parameters and operating conditions to the electrical room, cabin and control centre for monitoring and control. According to your requirements, our products are customized. Please contact us! 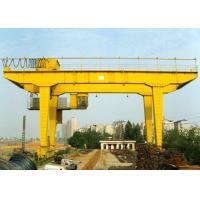 Henan Feima Crane Co., Ltd. established on 1982, as a designated manufacturer of former Ministry of Machinery. 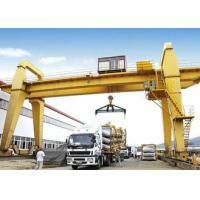 The company registered capital is 106.80 million RMB and total asset is 690million RMB. 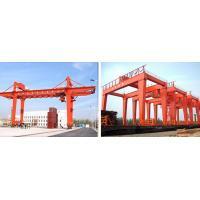 It covers an area of 600,000 square meters, including 350,000 square meters construction area. There are 2360 employees in the company, including 15 senior engineers, 68 engineers, 95 assistant engineers and 230 senior technical workers who are in charge of the products development and guide the manufacturing processing. There are 1200 sets equipments for manufacturing, processing and testing that could finish more than 20kinds crafts processing, such as grinding, milling, planning. The tenet of company: quality comes first and customer-oriented. 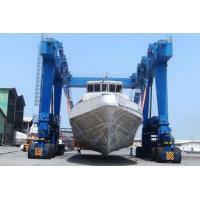 Deliver product and service with superior quality to the customers. The guiding principle of the company: create famous by quality, fast development by marketing, obtain benefits by management. There are all kinds of workshops for all China traditional electric wire rope hoists such as CD1/MD1/DJCD/DJMD/TZCD/TZMD/HM, meshing wire rope hoists such as SZCD/SZMD, explosion proof wire rope hoists such as BCD/BCDS/HB/HBS, European type wire rope hoists such as FOH/FOHS, etc., and for double girders single girders, semi girder cranes, such as types LD-A LX, ZX-A, BZQ-A, LH, QD, QB,QE,MH,MDG,MG, ME, MEC2, YC, QS U, MH for many different purpose such as for industrial workshop, ship yard, port loading and unloading, hydropower station, garbage station, meshing plants, railway bridge erecting, manufacturing, metal processing, assembling, electrical apparatus assemble, forging, thermal treatment, coating, testing. It is with strong research and developing ability, advanced technology, complete testing methods and quality guarantee system goes well. The company obtained certificates of ISO9001: 2008 international quality system, GB/T24001-2004 environmental management system and GB/T28001-2001 professional healthy system. By customer’s requirements we could apply CE certificates, SA certificates, to match customer’s quality demands. The company continuously makes scientific and technological innovation, develop new products, customized manufacturing for all customers all over the world, to meet higher- grade requirement of the market. “ First class products and First Class service” is the persistent management policy of the company. Welcome all customers to cooperate with us and we will do our utmost to make best quality products and provide best services.